New York New York; home to the bagel, the Rockefeller centre, Times Square, yellow cabs, cheesecake and of course, the famous slice of mouth-wateringly cheesy pizza. There’s nowhere else in the US that makes pizza quite like they do in New York. And then serves it in a handy single slice portion. But how can people in LA get a slice of authentic New York pizza? 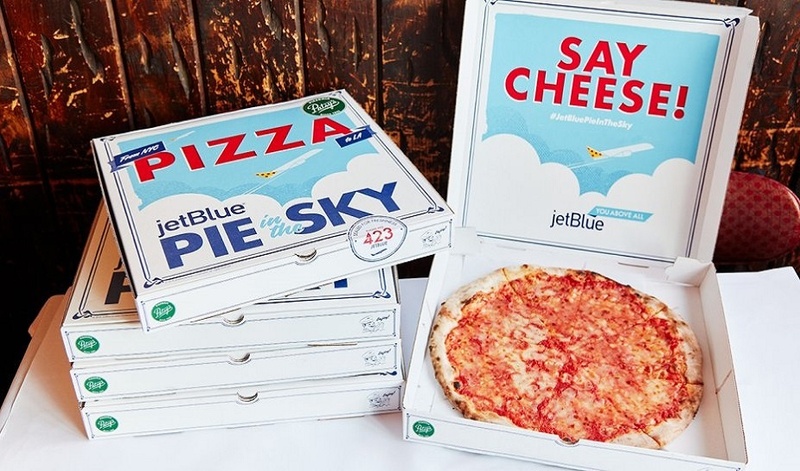 To demonstrate the simplicity and speed of its non-stop flights from New York to LA, airline Jet Blue partnered with Patsy’s Pizzeria, to launch Pie in the Sky, a unique air-born delivery service. 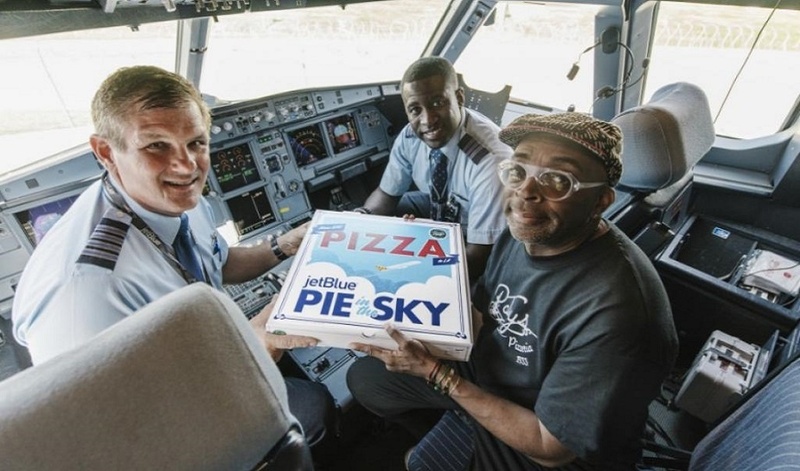 During a three-day period in May, delighted pizza lovers in select LA locations could order a genuine New York pie from Patsy’s in East Harlem through a dedicated JetBlue microsite and have it delivered to them at home. A clever marketing stunt designed to demonstrate the low-cost airline’s daily flights between JFK and LAX, the orders could be tracked online during their journey across the country. Available on a first-come, first-served basis, one of 1,050 pizzas could be bought through the campaign – cheese for $12 or pepperoni for $15 – and the airline covered all taxes, delivery and tipping fees. The pizza was delivered fresh and hot too. Each one was made from scratch every day at Patsy's and baked in their coal-fire oven. From there, it was packed for the flight and upon arrival at LAX, the pizza would be taken to a kitchen and prepped for final delivery. To ensure it remained at the best possible quality, the airline recruited the help of a specially trained pizza chef to oversee the logistics of the pizza's journey. Those who missed out on the limited run of tasty pizzas could jump on twitter and use #JetBluePizzaSweepstakes for a chance to win two round trip tickets to JFK and a Patsy’s Pizzeria gift card. The fun didn’t stop there. To raise awareness of the campaign further, JetBlue also created an amusing video with New York national treasure, Spike Lee, to teach people the dos and don’ts of eating New York pizza. The additional digital content helped to amplify the campaign and encourage online engagement with many people taking to twitter to praise the airline for its creative approach to marketing. Though some also used the social platform to share their grievance on the poor quality of the pizzas. The campaign brilliantly underpins JetBlue’s position as New York's Hometown Airline and builds brand love while effectively highlighting the daily flights available. The flight operator also couldn’t have chosen a better pizza restaurant to partner with. Patsy’s website modestly claims to the undisputed premier pizza dynasty in New York and suggests that the founder practically invented selling pizza by the slice. Effective brand partnerships can really add gravitas to a campaign, like this brick-tacular competition from LEGO and Air BnB and this impactful collaboration between Adidas and Berlin Travel Company BVG.